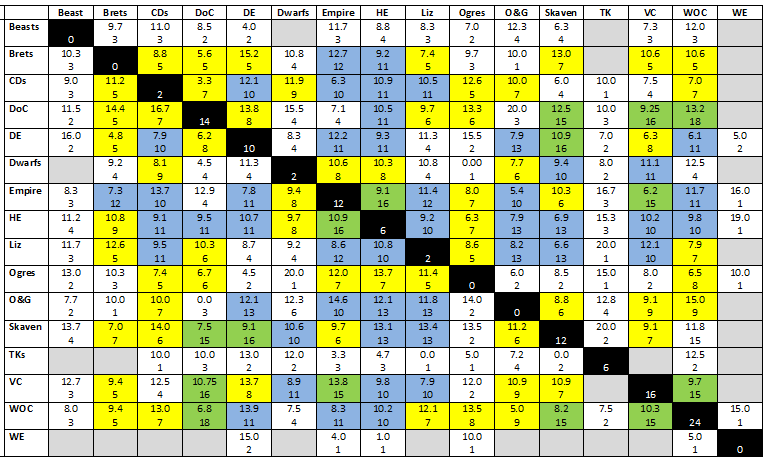 Trawling through the data to come out of this year's ETC, I have constructed a table which has Army vs. Army matchups at the event. The top number is the Average Battle Points scored while the lower number is the number of times the matchup was fought. As you ascend through the colours you have more certainty about the expected result. So what does it show? Scoring over 12 Battle Points on a Green Match shows that you definitely had the wood over those armies. In this case DoC vs Skaven or WoC. It means that the Comp needs to be realigned between these races (or in ETC speak "We Need to Nerf Daemons"). Scoring over 13 points in a Blue matchup is also a pretty solid indicator. Here Empire > CDs, O&G > Empire, Skaven > High Elves & Lizards and WOC > Dark Elves. When you drop to Yellow you need to be scoring 14-15 Battle Points for it to be meaningful. Here Brets > DEs, DoC > Brets and CDs, O&G > WoC and Skaven > CDs. So the immediate ETC AR.Com response will likely be a lessening of the extra 200 points for O&G and layers of comp onto the DoC book. Given the DoC book is generally seen as having weakened in 8th Ed compared to the 7th Edition version, perhaps more sensible would be the lessening of comp across the board to remove the brakes that have been applied to books in previous years. However you can't help but think that Warhammer is like a brick wall and each year the ETC AR.Com layers more and more coats of paint until the original finish is totally obscured. Then as a new year dawns rather than strip it back and start again, a new layer is applied. Or the removal of comp because the desired effect is already achieved by limiting to one of each army book. It is so painful that they can't see that. Interesting table Pete. I'm glad someone had the time to do the data presentation so we can all start our number crunching for future events. Although I hesistate to draw too much from it given there was only 1 Woodie player and like a billion WoC armies. Oddly enough in 11 games vs Daemons, High Elves averaged 9.5... Yup that Banner sure is broken! I was hoping I was wrong. Dark Elves are possibly the easiest match up for Woodies. Faith in hippie elvish kind restored. so how do you take these figures and develop the best matchups? take total points the army scored against the other army? Dark elves look like they need a step up averaging < 10 against almost all armies suggests the day of the dragon is over. Or that the comp measures they have taken neuter DE more heavily than other armies (which their caps on dice certainly contribute to).